Landsat 5 Thematic Mapper (TM) image of the northwestern corner of North Lake Eyre, Australia, after floods. The image was acquired on 28 March 2011, and displayed as bands 5, 4 and 2 as RGB ( i.e., short-wave infra-red, near infra-red and visible green displayed in the red, green and blue channels). 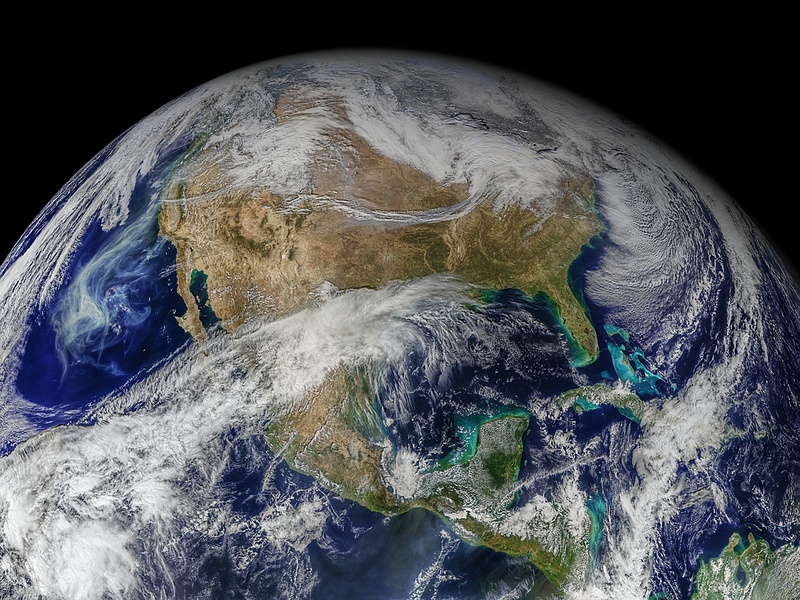 This image represents the beginning of operations of the VIIRS sensor on the NOAA-20 satellite (JPSS-1). The data used to construct the image were collected on 13 December 2017, just after the instrument's doors were opened. 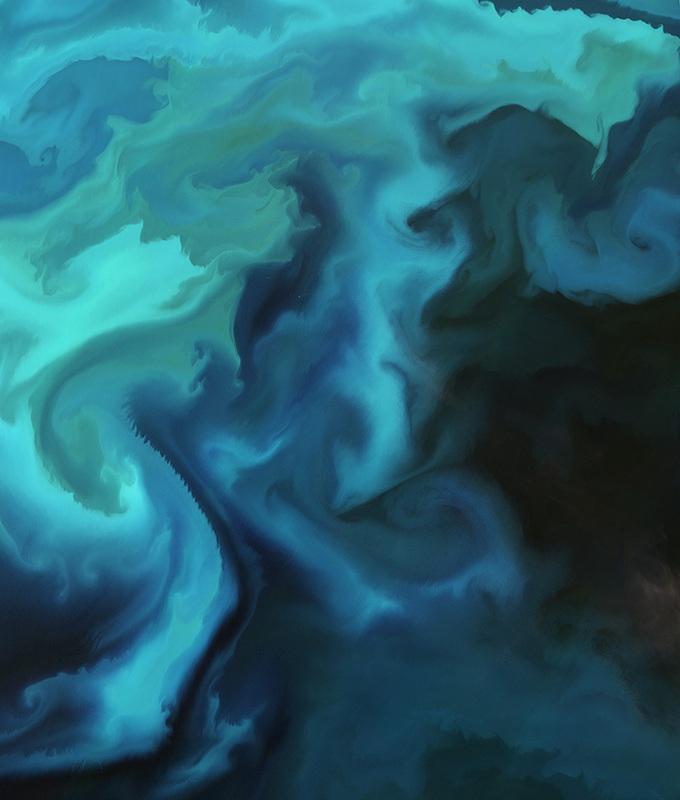 Although it may appear as a watercolour painting, this image is a natural-colour capture of a plankton bloom in the Barents Sea by the Sentinel-2A satellite on 30 June 2016. 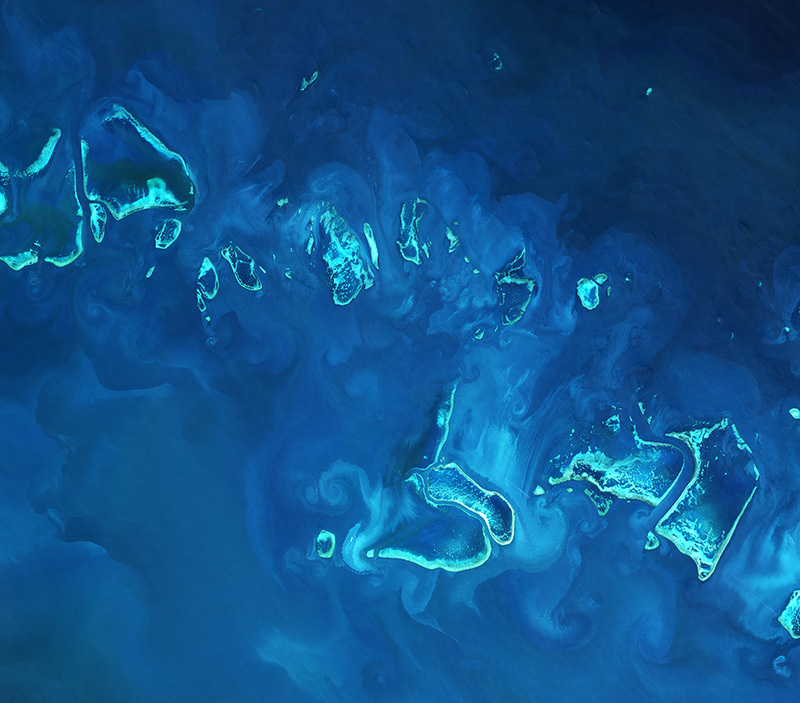 The Copernicus Sentinel-2A satellite takes us over part of the Great Barrier Reef off Australia’s northeast coast on 1 April 2017. Extending more than 2000 km and covering an area of some 350 000 sq km, it is the planet's biggest single structure made by living organisms, called coral polyps. Coral reefs worldwide are increasingly under threat from coral bleaching. This happens when algae living in the corals’ tissues, which capture the Sun’s energy and are essential to coral survival, are expelled owing to high water temperatures. The corals of the Great Barrier Reef have now suffered two bleaching events in successive years. Every year during winter months, the north-western Arabian Sea experiences an outbreak of Noctiluca scintillans algal blooms. Sometimes these blooms cause massive fish moralities along the coast of Oman. This image was captured by ISRO's OCM sensor on board the OCEANSAT-2 satellite on 11 February 2017 (click to enlarge). Copyright: Indian Space Research Organisation (ISRO). Al-Hashmi K., C. L. Smith, M. Claereboudt, S. A. Piontkovski, and A. R. Al-Azri. 2015. 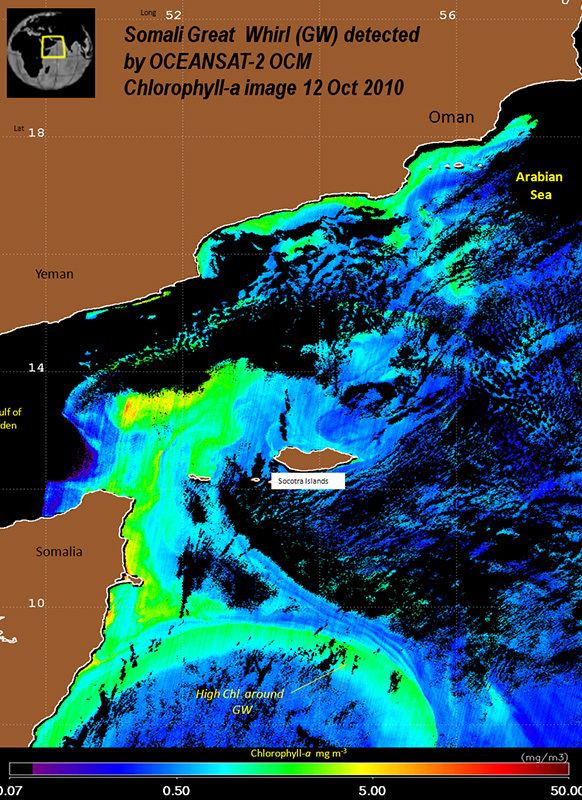 Dynamics of potentially harmful phytoplankton in a semi-enclosed bay in the Sea of Oman. Bulletin of Marine Science 91, doi:10.5343/bms.2014.1041. Goes, J. I., P. G. Thoppil, H. d. R. Gomes, and J. T. Fasullo. 2005. Warming of the Eurasian landmass is making the Arabian Sea more productive. Science 308: 545–547. Gomes, H. d. R., J. Goes, S. G. P. Matondkar, E. J. Buskey, S. Basu, S. Parab, and P. Thoppil. 2014. 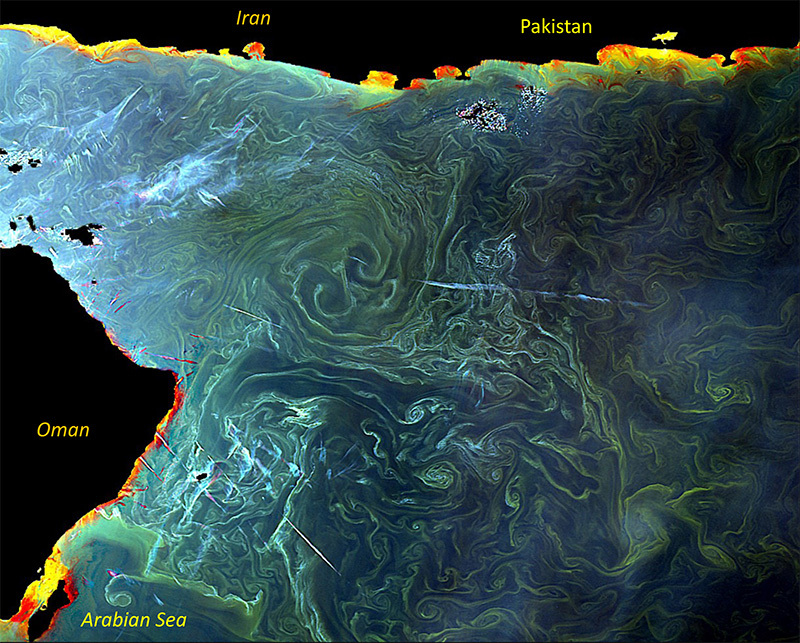 Massive outbreaks of Noctiluca scintillans blooms in the Arabian Sea due to spread of hypoxia. Nature Communications 5: 4862, doi:10.1038/ncomms5862. 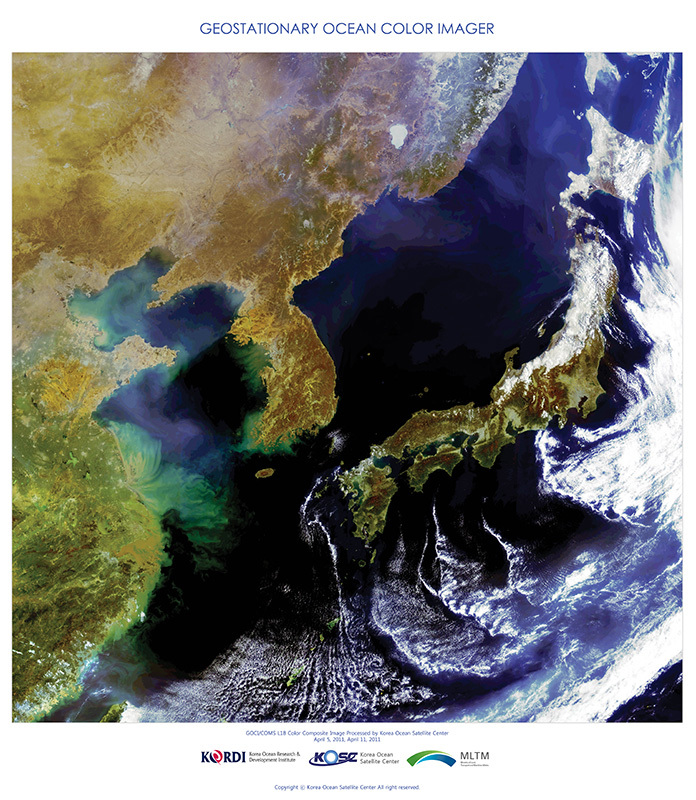 Level-1B composite image (5-11 April 2011) of eastern China, South Korea and Japan, captured by the Korean GOCI instrument on board the geostationary COMS satellite (image processed by KOSC, Korea Ocean Satellite Centre). A turbid plume of resuspended sediment originating from the discharge of the Yangtze River is clearly visible on the left hand side of the image. Resuspended sediments are prevalent in winter and spring, when strong seasonal winds cause mixing of the water column. Image provided by Dr. Yu-Hwan Ahn, KORDI (Korea Ocean Research and Development Institute). 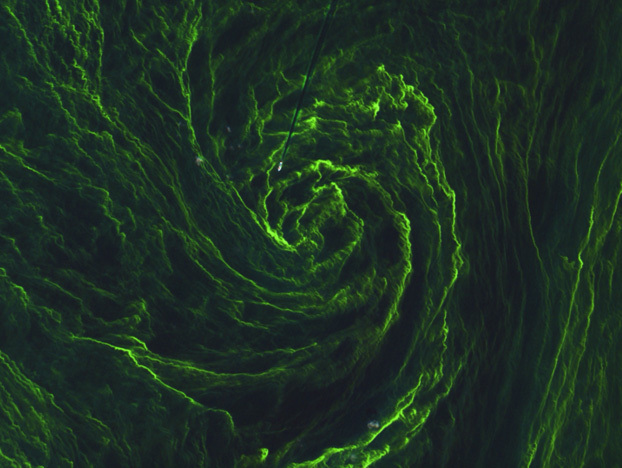 This chlorophyll-a image captured by ISRO's OCEANSAT-2 OCM instrument on 12 October 2010 clearly shows the Great Whirl off the Somali coast. The Great Whirl is a mesoscale feature (~450 km) associated with high chlorophyll concentration along its periphery. This circulation is caused by the north easterly acceleration of the Somali current through the Socotra passage around Socotra Islands. Such features are commonly seen in ocean-colour data during the transition period of the southwest to northeast monsoon in this region. Image provided by Prakash Chauhan, Indian Space Research Organisation (ISRO). 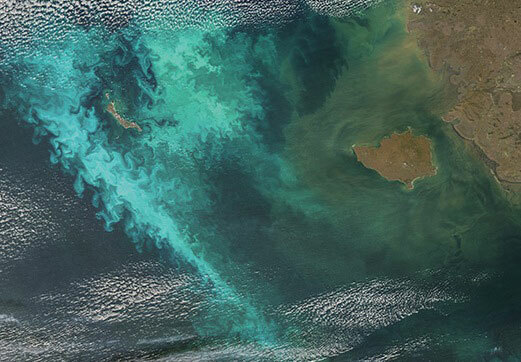 MODIS-Aqua captured this image of large phytoplankton blooms (likely coccolithophores) surrounding St. Matthew Island in the Bering Sea, on 8 October 2014. 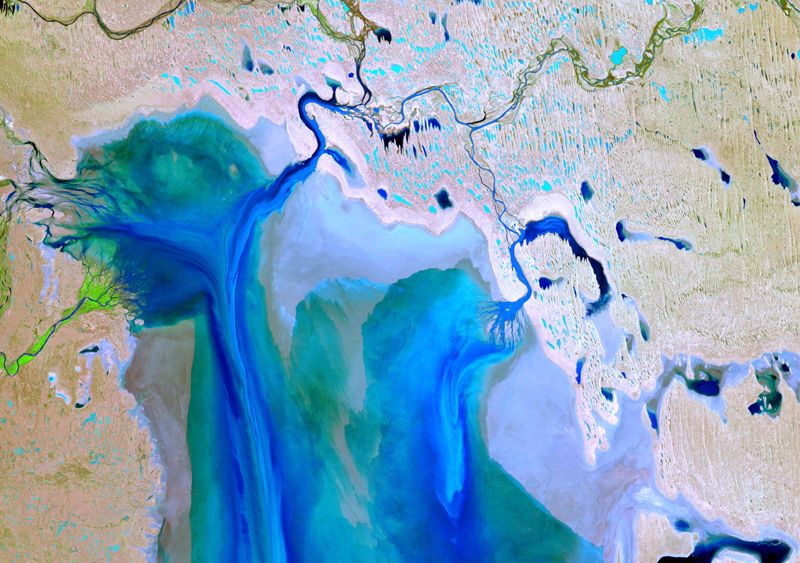 Browner, sediment-laden waters are also visible along the coast of Alaska. 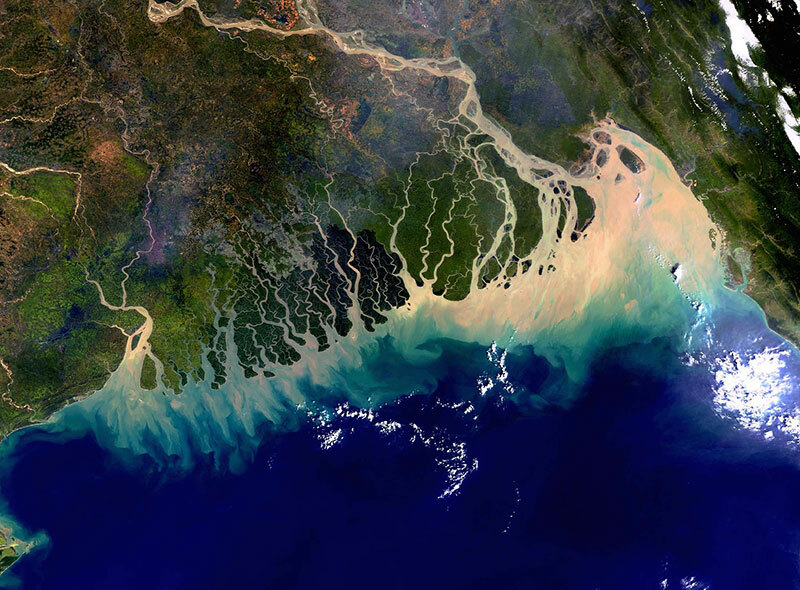 Captured by Envisat/MERIS sensor on 8 November 2003 showing the distribution of turbid suspended sediments in the Ganges delta. Credit: European Space Agency (ESA). 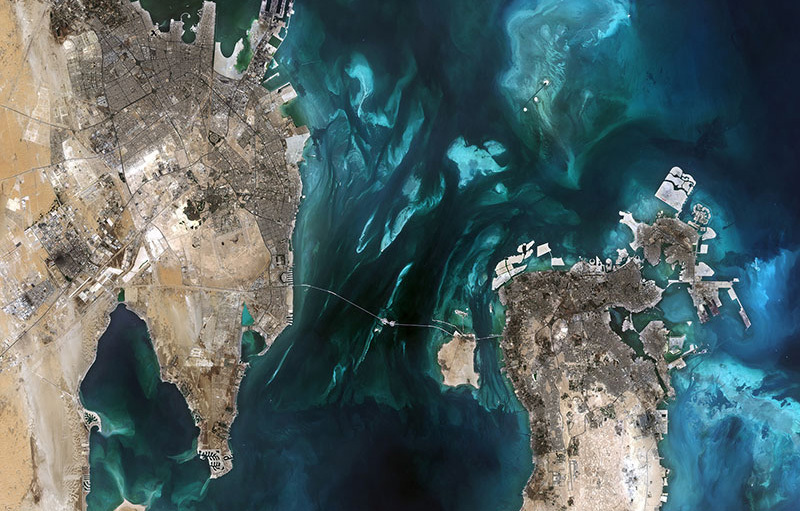 This beautiful, natural-colour image of the small nation of Bahrain and parts of eastern Saudi Arabia was captured by the high-resolution multispectral instrument on the Copernicus Sentinel-2A satellite on 18 September 2015. The striking variations of blue represent the shallow versus deep waters, with the presence of coral reefs.